Sunday Quote!- Adam and Eve had different names? | J.W. Wartick -"Always Have a Reason"
« Really Recommended Posts 5/29/15- Jesus or Muhammad, Kierkegaard, and more! Then that belief – the belief that these two were the historical founding couple – is misplaced because we know it’s not true. Mind you, it could have been true but we now know it it is not. There is one reason exactly to believe in the historicity of an Adam and Eve and it is this: a religious necessity. Too bad reality doesn’t comport. Strog assertion given Walton holds there were other humans at the time and Adam and Eve were chosen by God from among them. Do you have some heretofore unknown scientific discovery that allows us to locate where every hominid was at all times in the past that falsifies this claim? Or perhaps you have some evidence that there never were two early hominids at the same time? Please, produce such evidence for us. Strong* can’t edit on phone. Might not reply in timely manner or approve comments quickly. Apologies in advance. J.W., this knowledge doesn’t come from my ego but population genetics. If you better understood it, you wouldn’t make such a ludicrous argument. This idea Walton wants to present – that there were two people ‘chosen’ out of many – is clearly contrived. How do we know? Well, because this ‘retelling model’ fails to account for why the selected couple – selected by Yahweh don’t forget – then chooses to reject Yahweh’s presence and law! And that leaves the origin of this ill-chosen couple ‘sin’ for the rest of to magically inherit utterly unexplained. This retelling model fails to indicate how this ‘sin’ miraculously spread to everyone else. That’s why it’s a contrived model, as I said. And it doesn’t work to explain anything. What we do know is that the human population was never as small as 2 (or 8, in the case of the Noah story). And we know this because we can back-date the genetic diversity in our DNA. We can trace genes through the spread of ancient human populations out of Africa. Modern genes diverged from one another between 120,000 and 340,000 years ago first by following what’s misleadingly called the “Y chromosome Adam”. In addition – and this is important – the rest of our genome descends from other and multiple and different ancestors who lived at various time from 10,000 to 4 million years ago. Your DNA and mine indicate literally hundreds of such ‘Adams’ spanning a very great deal of time in our genetic ancestry. Go test yours. Selecting just one of these ‘Adams’ for the story to be compatible with modern genetic knowledge is completely arbitrary. And that still doesn’t help Walton’s belief at all. Second, we can also back date these DNA sequences for the size of the human population at different times. The absolute minimum for the migrating group out of Africa is 2,250 individuals added to the base of about 10,000. Anyone linked to any group of modern humans has the smallest possible human population ancestry of 12,250. This is the smallest possible ‘founding’ of modern humans. Have I mentioned that? The absolute minimum. Selecting any two from this minimum and calling them Adam and Eve doesn’t even cover the other 12,249 male ancestors of the particular Adam so chosen! Yet we are supposed to just go along with this Just So story by Walton and other theistic evolutionists and ignore compelling contrary evidence? Why, that sound suspiciously like confirmation bias to me. I’m not sure why you think this is supposed to be a problem. I can’t tell if you’re just not understanding or what, but Walton’s position (and that of plenty of others) is indeed that there is not at any point a minimum of two persons. Your weird questions like “Have I mentioned that? The absolute minimum” lead me to think that you’re either ignoring what I said earlier (and these authors’ positions) or just ignorant of them. Anyway, Walton (and others) agree that there are indeed some pretty large minimum amount of individuals. Yet due to concepts like federal headship, they maintain that God chose two persons to be representatives. Um, hello? Have you read anything Walton or others actually wrote on this topic? He’s not talking about genetic lineage. He’s talking about federal and spiritual headship. Your comment betrays either willful or genuine ignorance of various Christian positions on this topic. That’s not surprising–most people don’t know the range of positions. But you need to either get up-to-date or stop trying to treat this like a kind of knock-down argument. Walton and others have already thought this over and moved away from positions made seemingly untenable by the evidence. If you’re going to argue with them, you’re gonna need to catch up a bit. Your arguments might be devastating to young earthers or something, but they are pretty much irrelevant here. Get up to date. So you have no problem that we inherit a metaphorical sin and you’re comfortable that we then need only a metaphorical redeemer for it, right? Again, I’m not sure what you’re missing here. 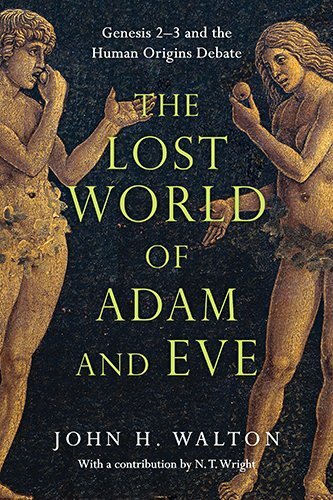 Walton and those who share his view hold that Adam and Eve were real people chosen to represent all people. The sin wasn’t metaphorical but real. The inheritance is not genetic, and it seems that once again you’re failing to think outside of your own narrow categories here. This idea is incoherent for several reasons. The first I thought obvious: because we – you and I – did not ‘inherit’ anything from a single couple other than our parents, we cannot have inherited this supposed sin. Ever. It doesn’t matter if someone claims that ‘god’ selected a couple. They are of either no or very little ancestry to you. I don’t know why you won’t or can’t grasp this point. The odds that you’re even related to any single couple is, at best, 1 in 2,250 and the odds only keep getting worse as time and generation passes. The second reason is selecting such a couple rather than ones who would obey divine orders reveals this god to be of questionable ability and/or very disturbing intentions. The ‘sin’ must have been preordained. That bothers me. Why doesn’t it bother you? To insist that the sin was real is, strange as it may sound, to make a virtue out of a necessity. After all, people really are curious. So shoot us… or in the ways of Yahweh, drown us. We have names for parents who do this to their children; why grant a moral exception to a god willing to do this to us – his supposed creation? I’m sorry, J.W. : I don’t think the failure of a cohesive and coherent explanation rests with me in this case; but I think it’s very interesting how many people are willing to go along with it… for reasons, as far as I can see, that have nothing to do with understanding and everything to do with supporting an irrational faith. Your failure is in that you keep thinking in biological categories. I don’t know how I can make this more obvious to you, and I’ve learned in the past that at some point I have to stop trying. That point in this conversation is now. Just for anyone else reading: the issue of inherited sin is not based on genetics. I don’t know how I can state this more plainly, and I don’t really know why this point continues to be ignored. Oh well. Well, if it’s not an ‘inherited’ sin in the genetic sense (where we have no choice in the matter), then the term makes no sense except in the form of a bequeath. That means it can be refuse. I refuse the bequeath, thank you very much, and I urge others to refuse it, too. Why would anyone in their right mind accept it unless they have a wish to see themselves as eternally broken and pathetic and in need of saving from themselves by choice? Do you have a choice for the world you’ve inherited from our ancestors? Do you have a choice in the inheritance of racial injustice that we live in? Do you have a choice in any number of issues that we have inherited without being genetically linked to the exact person(s) who caused it? Nope. Can you work against it? Sure. But you can’t just choose to live in an unpolluted world. Maybe all of your ancestors didn’t pollute; maybe they all lived off the land. I guess you can choose to live in a bubble free of pollution. You don’t accept the world we live in. Somehow, then, the world just bends to your will? Once again, a complete misunderstanding. Hang on… you can’t jump back and forth between the impersonal world and the personal this way. Inherited sin has to be personal and not impersonal as you’re trying to allude to by analogy. Sure, all of us inherit the world that preceded us but we’re not held personally accountable for a million year old meteor strike or the effects from the Peloponnesian war. We are held responsible for ourselves. Your trying to insert a personal sin by impersonal means. If so, why the charade with a hypothetical but supposedly ‘real’ Adam and Eve for a sin orchestrated by this supposed god? You’re allowing two different standards to be used here, which is why this apologetic version of ‘inherited’ sin is neither coherent nor consistent. Link me personally to this Adam if you want me to be responsible for inheriting something from him, something over which I may exercise my will, my choices. Don’t assign to me personal responsibility for a hypothetical ‘sin’ committed by another in another time and another place. Holding me responsible for something over which I had no say is immoral because if I do not have the power to alter it then I do not have any responsibility for it. Once again, you refuse to think outside your limiting categories. Simply confining oneself in a box and saying “nothing outside this box exists” is interesting, but doesn’t impact reality. You’re apparently refusing to understand any possibilities beyond genetic inheritance, and I’ve pointed this out time and again. I’ll let readers decide at this point. Remember, the point of scripture is for us to understand, isn’t it? Now look at the convolution you have to undergo to try to arrive at a real Adam and Eve the way Walton suggests and then revisit the charge that I’m “apparently refusing to understand.” I’m just pointing out that I understand perfectly well why you need to go through all the convulsions: it has to do with comporting a belief claim with an unwilling reality.